Definition at line 25 of file CEFMMethod.h. Definition at line 80 of file CEFMMethod.cpp. Definition at line 86 of file CEFMMethod.cpp. Definition at line 94 of file CEFMMethod.cpp. Definition at line 101 of file CEFMMethod.cpp. Reimplemented in CBitPatternTreeMethod, CBitPatternMethod, CEFMAlgorithm, and CSSAMethod. Definition at line 104 of file CEFMMethod.cpp. CEFMMethod class This class describes the interface to all optimization methods. The various method like RandomSearch or GA have to be derived from this class. Definition at line 47 of file CEFMMethod.cpp. References CCopasiMethod::EFMAlgorithm, CCopasiMethod::EFMBitPatternAlgorithm, and CCopasiMethod::EFMBitPatternTreeAlgorithm. Referenced by CEFMTask::CEFMTask(), and CEFMTask::createMethod(). Definition at line 109 of file CEFMMethod.cpp. References CCopasiMessage::ERROR, CEFMProblem::getFluxModes(), CCopasiObject::getObjectParent(), CCopasiTask::getProblem(), CEFMProblem::getReorderedReactions(), MCEFMAnalysis, mpFluxModes, mpReorderedReactions, and pTask. 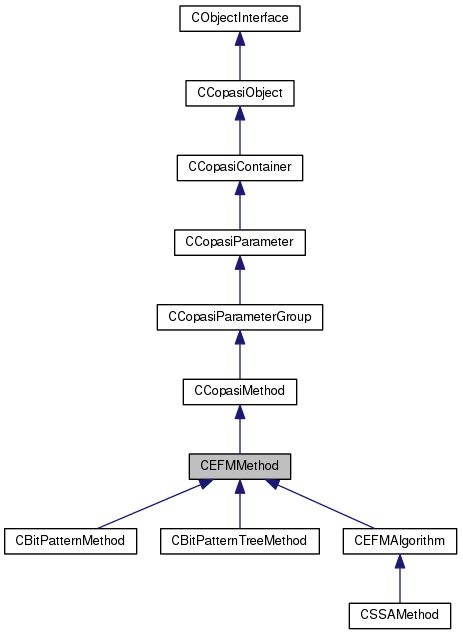 Referenced by CEFMAlgorithm::initialize(), CBitPatternMethod::initialize(), and CBitPatternTreeMethod::initialize(). Definition at line 136 of file CEFMMethod.cpp. References CMatrix< CType >::array(), C_FLOAT64, CCopasiMessage::ERROR, CCopasiProblem::getModel(), CCopasiObject::getObjectName(), CModel::getReactions(), CModel::getRedStoi(), CCopasiMethod::isValidProblem(), MCEFMAnalysis, CMatrix< CType >::numCols(), and CMatrix< CType >::size(). Definition at line 91 of file CEFMMethod.h. Referenced by CBitPatternTreeMethod::addMode(), CBitPatternMethod::addMode(), CEFMAlgorithm::buildFluxModes(), initialize(), and CEFMAlgorithm::initialize(). Definition at line 96 of file CEFMMethod.h. Referenced by CBitPatternTreeMethod::buildFluxModes(), CBitPatternMethod::buildFluxModes(), CBitPatternMethod::buildKernelMatrix(), CBitPatternTreeMethod::buildKernelMatrix(), initialize(), and CEFMAlgorithm::initialize().